Your surgeon will make a surgical cut in your groin after using some numbing medicine. You will also be given medicine to relax you. If you have a blocked artery in your heart, legs, or neck, you may need a stent to keep your blood flowing to prevent serious problems. Let’s talk today about stents.A stent is a tiny tube we place in an artery, blood vessel, or other duct (such as the one that carries urine) to hold the tubes open. A stent is left in permanently. Most stents are made of metal or plastic mesh-like material. Stent grafts made of fabric are often used in larger arteries. 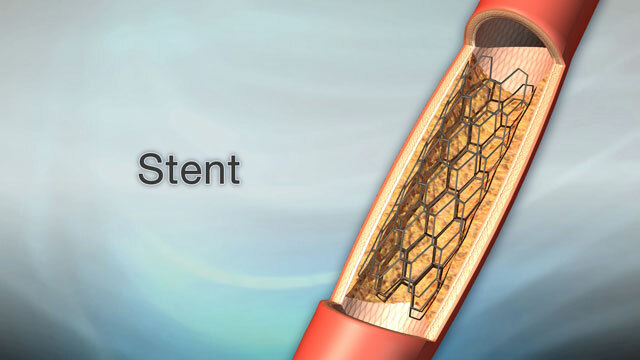 Stents are used to treat a variety of artery and other problems. Your doctor will make a small cut in a blood vessel in your groin and thread a thin, flexible tube called a catheter to the place in your body where you need a stent.In the heart, a fatty substance called plaque can build up inside the coronary arteries. Plaque narrows the arteries, reducing the flow of oxygen-rich blood to the heart. One stent, called an intraluminal coronary artery stent, is a small, self-expanding, metal mesh-like tube that is placed inside a coronary artery after balloon angiography. This stent prevents the artery from re-closing. Another stent is coated with medicine that helps further prevent an artery from re-closing.In the carotid arteries, which are on both sides of your neck, plaque can build up and slow the flow of blood to your brain. Stents can keep the carotid arteries open. Stents can also open up narrow arteries in your legs caused by peripheral arteriole disease. They’re also used to treat an abdominal aortic aneurysm, which is when the large blood vessel that supplies blood to your abdomen, pelvis, and legs becomes abnormally large and balloons. After a stent procedure, your doctor will probably recommend that you take aspirin and another anti-clotting medication to prevent blood clots from forming in the stent. Make sure that you talk to your doctor, before getting a stent, about the risks associated with placing a stent to treat your condition, such as tissue growing around the area where the stent was placed. Your health care provider will do a physical exam and perform several medical tests. Take the drugs you have been told you to take with a small sip of water. Amarenco P, Labreuche J, Mazighi M: Lessons from carotid endarterectomy and stenting trials. Lancet. 2010;376(9746):1028-1031. PMID: 20870079 www.ncbi.nlm.nih.gov/pubmed/20870079. Brott TG, Halperin JL, Abbara S, et al. 2011 ASA/ACCF/AHA/AANN/AANS/ACR/ASNR/CNS/SAIP/SCAI/SIR/SNIS/SVM/SVS guideline on the management of patients with extracranial carotid and vertebral artery disease. J Am Coll Cardiol. 2013;81(1)E76-E123. PMID: 23281092 www.ncbi.nlm.nih.gov/pubmed/23281092. Brott TG, Hobson RW, Howard G, et al: Stenting versus endarterectomy for treatment of carotid-arery stenosis. N Engl J Med. 2010;363(1):11-23. PMID: 20505173 www.ncbi.nlm.nih.gov/pubmed/20505173. Gurm HS, Yadav JS, Fayad P, et al: Long-term results of carotid stenting versus endarterectomy in high-risk patients. N Engl J Med. 2008;358(15):1572-1579. PMID: 18403765 www.ncbi.nlm.nih.gov/pubmed/18403765. Kinlay S, Bhatt DL. Treatment of noncoronary obstructive vascular disease. In: Mann DL, Zipes DP, Libby P, Bonow RO, Braunwald E, eds. Braunwald's Heart Disease: A Textbook of Cardiovascular Medicine. 10th ed. Philadelphia, PA: Elsevier Saunders; 2015:chap 60. Through telemedicine technology, stroke specialists in the Sutter Health network provicde video conferencing in communities outside of San Francisco bringing top-notch stroke care to community hospitals.